What are the Benefits of a Retractable Awning? Even though winter has been a little stubborn and doesn’t want to leave, warmer weather is right around the corner. If you want to take full advantage of your deck or patio this summer but still want to avoid excessive sunlight and heat, then you should be in the market for a retractable awning. You can’t predict the weather, but you can control it! While a fixed awning is great to have, it’s somewhat limited in its abilities. 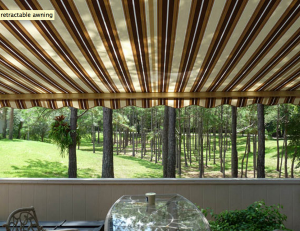 If Mother Nature decides to produce a 100-degree day but you want to be outside, your retractable awning can provide the shade you need to stay comfortable. But what happens if it’s nice and cool in the evening, and you want to gaze at the sky? No problem! Just let the retractable awning do its magic, and you will quickly have a full view of the stars and moon. There are times when having the awning is perfect, but there are just going to be a few occasions where you wouldn’t need it. The retractable awning fixes that problem, and you have full control and flexibility over the elements on your patio or deck. While a fixed awning will take a beating from extreme weather, a retractable awning will not have those same issues. Strong winds and hailstorms can really put a beating on a fixed awning. With a retractable awning, you won’t have to worry about those issues. If the wind seems strong enough to lift a car in the air and is throwing debris everywhere, you can quickly retract your awning. Just like the name indicates, a fixed awning is fixed to its location. A retractable awning is much more flexible, which will increase longevity. Whether you want to protect your outdoor furniture or save on cooling costs, a retractable awning is an investment that will help save you money. Your patio or deck furniture can easily start to deteriorate with excessive heat, but an awning will help to keep your furniture protected during the summer and warmer months. Aside from furniture protection, a retractable awning will help you save on your energy bill as well. The awning will cut down on sun streaming into your home, which will provide for less of a need to crank the air conditioning. With superb service, competitive pricing and unfailing attention to detail, Carrol Awning provides innovative craftsmanship for customers throughout Maryland and Virginia. Carroll Awning provides the best quality awnings and frames for any business or restaurant, as well as homes and apartments, for any time of the year. For a free estimate, call 1-800-999-5617 or click here to contact us online.